We asked our friend and journalist, Carla Carlton, to be a guest blogger for April Straight Up. Carla used this opportunity to discuss the record-breaking bourbon production over the past couple of years and how we’re now living in the “new” Bourbon renaissance. If you’d like to read more from Carla, and we recommend you do, check out some of her other work on her website, TheBourbonBabe.com. 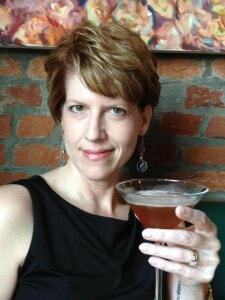 She’s also a regular contributor to The Whiskey Wash, Bourbon Review and Food & Dining. Her first book, Barrel Strength Bourbon: The Explosive Growth of America’s Whiskey (Clerisy Press, 2017), will be published this spring. If you’re reading this newsletter, you’re a fan of Bourbon—Four Roses Bourbon, no doubt. And since you’re an aficionado, I’m sure you’ve heard that there are currently more barrels of bourbon aging in Kentucky (6.6 million) than there are Kentuckians (4.4 million). It’s an impressive number, to be sure. But did you know that it’s actually 2 million barrels less than Kentucky distillers had in inventory in 1967? That’s right: Fifty years ago, there were 8.6 million barrels under roof in the Bluegrass State. Distillers had cranked up their production lines following the end of World War II to slake the thirst of happy, prosperous Americans. The 1950s were a Golden Age for Bourbon, and there was no reason to think the boom wouldn’t continue. But in the mid- to late 1960s, consumer tastes began to change. Young people, having rejected whiskey along with everything else the previous generation had preferred, were drinking lighter distilled spirits such as tequila and vodka, along with beer and wine. By 1970, having failed to foresee this shift when they made their sales predictions years in advance, distillers had a glut of inventory that no one wanted. The year 1971 saw drops in both new production and inventory. It was the beginning of a trend that would continue for the next 28 years. By 2000, overall inventory had fallen to 3.4 million barrels. That same year, however, the total number of new barrels filled took an upward tick. The current Bourbon Renaissance had begun. What happened? Bourbon producers took a page from the Scotch industry, where single-malt whisky had become a prized—and pricey—commodity, and created a new category of premium brands. These single barrel and small batch Bourbons showcased the complex flavors of Bourbon and carried price tags commensurate with quality, and customers responded. Four Roses is a prime example. One of the most acclaimed Bourbon brands nationally during 1940s and ’50s, Four Roses nearly disappeared in the 1960s when then-owner Seagram & Sons banished it overseas in favor of blended whiskey. Following its return to the U.S. after its purchase by Kirin in the early 2000s, Four Roses has once again become one of the most respected brands in the business. Bourbon innovation continues today, as distillers produce increasing numbers of limited editions and special finishes—and more and more Bourbon in general. Collectively, Kentucky distillers produced more than 1 million barrels in each of the years from 2012 to 2015. In 2015 alone, in fact, they filled 1,886,821 barrels—the highest number in any one year since 1967. Will we ever surpass that 1967 “high-bourbon mark” inventory of 8.6 million barrels? It’s hard to say, but if we don’t, it will be for a happy reason: People are drinking Bourbon faster than distillers can make it. Cheers to that—and as always, enjoy your Bourbon responsibly.